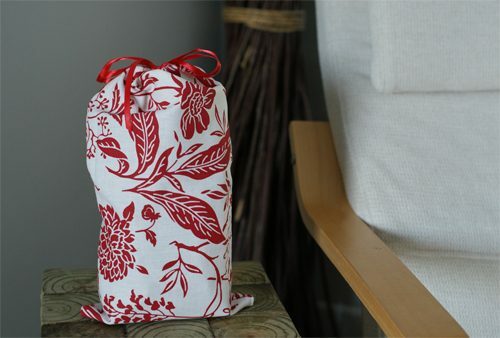 Sewing a fabric bag may seem overwhelming if you don’t do a lot of sewing, but it’s actually really easy. Easy enough that I did it! I love how this bag turned out, and I’d love to get some more of this fabric (which is an upholstery fabric from Walmart’s recently reopened fabric section) to make a complete set for under our tree. Honestly, I don’t even know anything about which stitch does what on my sewing machine, but I’m not sure you really need to for this project! Cut out two identical panels, slightly bigger than the size you’d like your bag to be. Fold the top edge of each piece in to form a tube for the ribbon and pin in place. Sew a tight straight stitch across each folded piece of fabric, leaving enough space to thread a ribbon or string through the tube once you’re done. Leave an allowance of 1/4-1/2″ on the ends of each tube because you’ll trim these at the end once the bag is together. Place the panels right side together and sew around the three remaining sides using a stretch stitch, starting and ending below the tube at the top. You’ll need to trim the tubes at this point. You can either cut the ends off — being careful not to cut the seam you added earlier — or fold them back inside the ends of the tube. Use a tapestry needle or safety pin to thread the ribbon through the tube.